Conserveira de Lisboa has the privilege of being located in the heart of the city, making it easier to visit it. 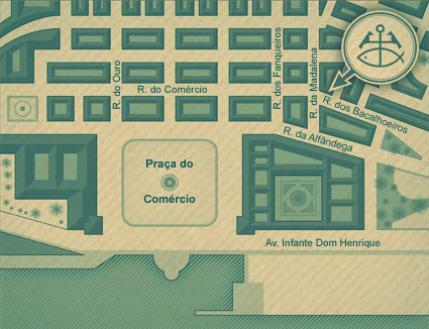 If you come by car, there is a parking lot in Campo das Cebolas. If you prefer the tram, take the traditional 28E and enjoy the tour, or you can take the 18E for a river sightseeing (after or before the visit) and also the 25E for a picnic in Jardim da Estrela with our cans. What ever your option is, don’t forget you are getting off in Praça do Comércio and then you are within a five minutes walking distance. If you choose the subway, take the green lane to Baixa/Chiado station (10 minutes walking) or the green lane to Praça do Comércio station (5 minutes walking). To know which bus route you should take, go to Carris and find the most suitable one, bearing in mind that your destiny is Praça do Comércio.